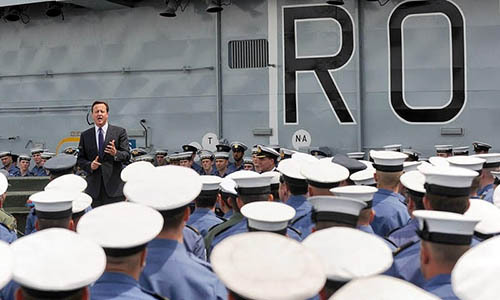 David Cameron addresses Ark Royal's Ship's Company - 24th June 2010. January - Portsmouth. Base Assisted Maintenance Period (BAMP). 25th January - Assume role of Fleet Flagship. 29th January - Assume duties of the High Readiness Strike Carrier. 8th February - Sail for post-maintenance trials. 15th - 17th February - Ammunition ship at Glen Mallen Armament Depot. 24th February - Arrive in North Shields (visit includes Ship Open To Visitors). 1st March - Sail from North Shields for air work-up. 15th March - Operational Readiness Inspection. 18th March - Portsmouth for pre-deployment preparations. 6th April - Sail from Portsmouth for the AURIGA Deployment. 10th - 20th April - Exercise JOINT WARRIOR 101 (JMC). 21st April - On stand-by to repatriate British travellers stranded in France due to the Icelandic volcanic ash cloud. 22nd April - Unplanned return to Portsmouth. 27th April - Emergency dock-down in "D" Lock to repair damaged sea chest. 6th May - Undock and cold move to Sheer Jetty. 7th May - Sail from Portsmouth to resume planned deployment. 14th - 18th May - Visit to Norfolk, Virginia. 19th - 27th May - Exercise CAPELLA STRIKE with the USMC. 28th May - Arrive in Mayport, Florida for stand off. 4th June - Sail from Mayport. 4th - 10th June - Exercise SEASWITI. 11th - 14th June - Norfolk, Virginia. 15th - 22nd June - Exercise HALCYON RENDEZVOUS. 23rd June - Arrive in Halifax, Nova Scotia for a formal visit. 24th June - Visit by the British Prime Minister, David Cameron. 29th June - International Fleet Review by Her Majesty The Queen and the Duke of Edinburgh. 30th June - Sail from Halifax for the Composite Training Unit Exercise (COMPTUEX). 27th July - Arrive in Port Canaveral, Florida for an informal visit. 1st August - Sail from Port Canaveral. 13th August - Portsmouth for maintenance and Summer leave. Berth at Victory Jetty. 2nd September - Cold move to "D" Lock. 4th September - Incline Experiment. 6th September - Cold move to Victory Jetty. 14th September - Captain Jerry Kyd joins as Commanding Officer. 27th September - Sail from Portsmouth for weapons trials and Apache deck landings. 1st - 4th October - Visit to Faslane. 4th - 14th October - Exercise JOINT WARRIOR 102 (JMC). 19th October - Strategic Defence & Security Review results announced. Ark Royal to be decommissioned. 1st November - 25th Anniversary Dinner for all twelve of Ark Royal's Commanding Officers and Sir Donald Gosling. 5th November - Visit by Her Majesty The Queen. 9th November - Sail from Portsmouth. 12th - 17th November - De-ammunition ship at Glen Mallen Armament Depot. 19th - 23rd November - Visit to North Shields (includes Ship Open To Visitors). 24th November - Final four harriers take off from Ark Royal's flight deck. 25th - 30th November - Visit to Hamburg, Germany (includes Ship Open To Visitors). 3rd December - Arrive Portsmouth at Procedure Alpha, flying the decommissioning pennant. Berth at Victory Jetty.